Resume Editing Services Online - Go Hunters! Have you ever struggled with creating a perfect resume? It is a common problem that even people who have worked for many years face. Resume is the very first thing you are judged on, and even if you are a good specialist, a lousy resume can stand on your way of getting a great job. In a resume, details matter a lot and everything should be checked several times. For instance, did you know that about 70% of resumes are rejected by big companies because of the unprofessional email address? Our editors know about every single detail that counts. Order our resume editing services to make sure everything is right and on its place! The interesting fact is that in average, HR managers in top companies spend 5-7 seconds on one resume. Think of how impressive your resume must be to catch their attention. You need to put everything in the right words and format your work in the most appealing way. If you are not sure you have done everything like that, let us check! Quality editing doesn’t have to be expensive! Our resume editing services are one hundred percent professional. However, our mission is to help you not robbing you blind. The rates you’ll see on our site are all affordable and beyond reasonable. For a good price you get a resume that will win all the HR managers over. Spend your money profitably with our resume editing ! Statistics show that on every corporate job vacancy, there are more than 200 resumes. Moreover, only 5-7 candidates are asked to come to an interview. It means that the rest 193 candidates can forget about this work. If you don’t wish to be among them, better make your resume memorable. We can definitely assist you with this matter. 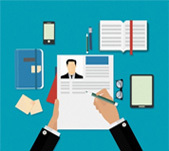 Our resume editing services are focused strictly on making your resume look flawless. Of course, your skills, qualifications and experience matter a lot, but the way you put it all on a paper matters a great deal, as well. Finding a good editor for any kind of writing is difficult. 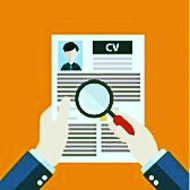 If your task is to edit my resume, it is even harder, as you need to find not only a person who is good with grammar, but a person, who knows how a great resume should be structured and what resumes are most likely to win an interview for you. We have the exact editors! Order the resume editing service from us and see that for yourself. "I have never liked dealing with resumes. It is much easier for me to just talk to a person and to tell them about all of my skills and qualifications. However, this is not how things work and you have to provide a resume first. I managed to create one, but I didn’t like how it looked. I’m so glad that I stumbled upon these resume editing services as they made mine look really great." "I have been looking for someone qualified to edit my resume for so long that I was quite desperate. Thank you guys so much for turning my pathetic attempt of a resume into something so great. It looks like I really am a great candidate for a cool job now. I will recommend you guys to all of my friends." "A good resume editing service is very hard to find as not so many people actually know what recruiters and HR managers really want to see. I’m lucky to have found such a service and to find a job after they edited my resume. I wish you many loyal customers along with myself." "I didn’t know there is such a thing as resume editing. I’d been looking for a job for a long time and often I received no feedback after sending my resume. I thought I wasn’t qualified enough for the jobs I wanted. However, my friend suggested me to work on my resume or have professionals work on it. After I had it edited by this great service, I got the job in a week! " "I really needed someone to edit my resume for a job as I’m not a native speaker and I wasn’t sure I wrote everything in the right way. Apart from correcting all the spelling and grammar mistakes, my editor also rearranged the paragraphs and made it more logical and structured. I really appreciate the job."